Srinagar: Five militants were killed in a gunfight at Keelam area of south Kashmir’s Kulgam district on Sunday. Official sources said that three militants were killed during the initial gunfight and the fresh exchange of firing resumed soon after earth movers were pressed to clear the debris of the house to retrieve bodies of slain trio militants seen lying near the spot. The remaining militants believed to be two in number took shelter in a nearby house and opened fire which was retaliated by the forces, they said, adding that both the hiding militants were killed. Senior Superintendent of Police (SSP) Harmeet Singh Mehta also confirmed that the five militants have been killed and their bodies along with arms and ammunition were recovered from the site. “The identity of the slain is being ascertained,” SSP said. Another police official said that all the slain are said to be locals and were believed to be affiliated with Hizb ul-Mujahideen outfit. Five militants were killed in a gunfight with the government forces, even as dozen protesters were wounded in ensuing clashes in Keelam area of South Kashmir’s Kulgam district on Sunday. Reports said that five militants were killed in the gunfight that broke out today morning after the forces launched a cordon-and-search-operation. A police official said the identification of the slain militants is being ascertained. Reports said that clashes erupted soon after the gunfight broke out today morning. 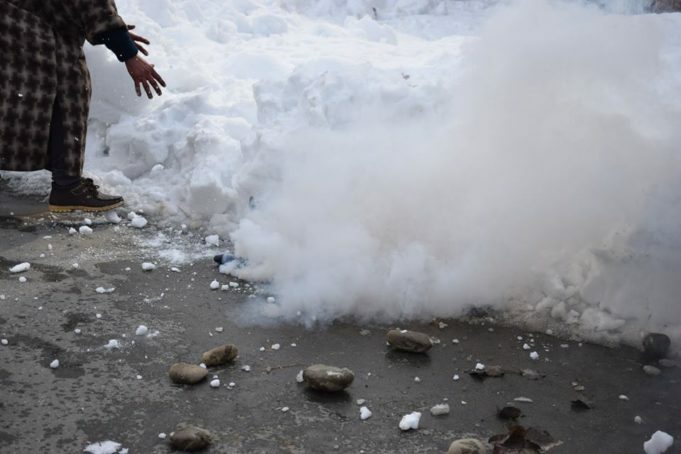 They said the forces fired pellets and tear gas at the protesters who were pelting them with stones. A health official said that twelve persons were injured in the clashes with ten of them hit by pellets. Internet was suspended in the district soon after the gunfight broke out today morning.